Our systems perform well because they’re designed well. Corner Audio & Video listens to your needs, first. We then combine our experience with the most innovative products to provide the right system for your space and budget. We deliver turnkey systems that work perfectly from day one. 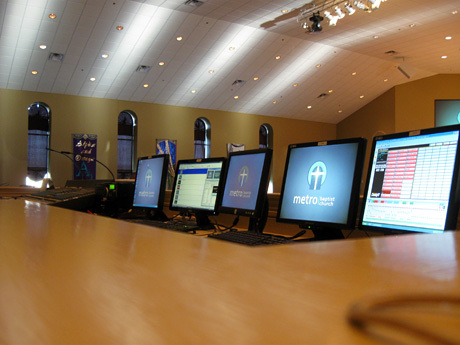 Our media systems deliver clear, appropriate sound levels and increased visibility to every part of your worship, entertainment or athletic space. Wherever possible, we mount components discreetly so the focus stays on your event, not on the equipment. Every project offers unique challenges, so we offer individually tailored solutions. We begin by scheduling a visit to evaluate your existing system and space, and to assess your needs. We then partner with our acoustic specialists and equipment suppliers to create the best possible sonic environment for your event space. We will assess your existing building or sanctuary. If you are designing a new space, we will work from your blueprints. We will create a system blueprint or design plan. We will provide a list of all recommended equipment. We will submit a budget and time frame for project completion. Once all details have been reviewed and approved, we will schedule your system installation. Learn more about the installation process.